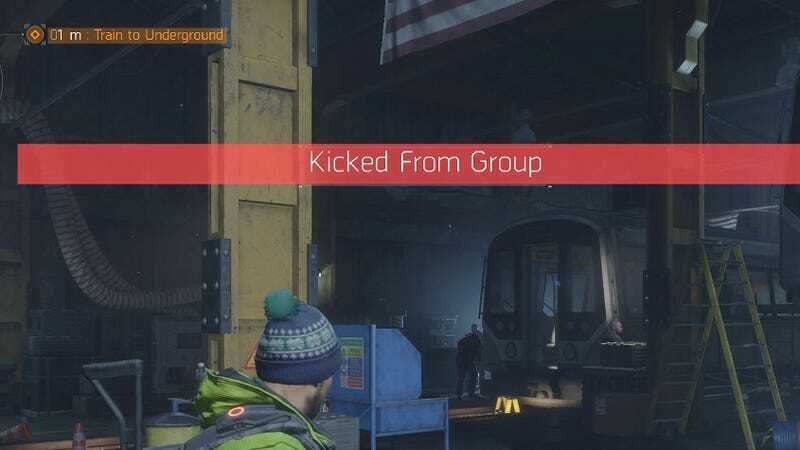 I’m trying to get into The Division’s new Underground DLC, but apparently no one wants me in their group. Two nights ago, I was matchmaking my way into the new randomized four-player co-op Underground missions in Ubisoft’s morose open-world shooter. I was having a grand old time. Last night, however, I tried to do the same and kept getting kicked from the groups I joined. I started the night with a level 174 gear score, which is about what you will have earned if you’ve done every story mission and side mission in the main game but haven’t done a lot of endgame grinding. I started with a “hard” mission. Recommended gear score according to the game’s menus? 160. The people I was matchmade with? 191, 195 and 211. We went on a mission. We all died. I was ready to try again. Nope! Kicked from group. I immediately joined a new group. They were 194, 214 and 226. I headed over to the train tracks, where missions begin. Back to matchmaking. Remember, the recommended score for hard missions is 160, and I was at 174. This time, I didn’t even get to see the scores of the people I got matched with. I was kicked right away. Fourth try. I was matched with a 231, 228 and a 216. One might wonder why they were running a hard mission and not a “challenging” one. Challenging missions have a recommended gear score of 200. Whatever. We did a mission. I think we did pretty well. The 231 even dropped a nice piece of loot and then shot at me, which I took to mean he was inviting me to take it. I did. I didn’t have anything to give back. Nothing that good. Bad etiquette? We were back in the staging area, and, guess what? Kicked from group. Note: everyone else is this game seems to be over 200! And I thought I’d helped the team win. Bummer. Hey, at least with all the loot from that mission I got myself up from 174 to 193! I tried matchmaking again. For yet another hard mission, I was matched with people who were 230, 240 and 243. Would they let me play with them? At that point we were at five kicks for only two missions played, one of which everyone died in and the other which was a group win. On my sixth try, I was matched with a 202, a 208 and 212. We started a mission, we all got killed, we tried again, we succeeded. And I wasn’t even kicked. I suspect I’ll need to be up to 200 gear score before people stop trying to kick me as soon as they see me join their match. But I’ve got to wonder: Why does this game seem to only have really high-level players? Why are all these high-level players trying to play missions that are so far below their level? And would they all please stop kicking me from their groups?